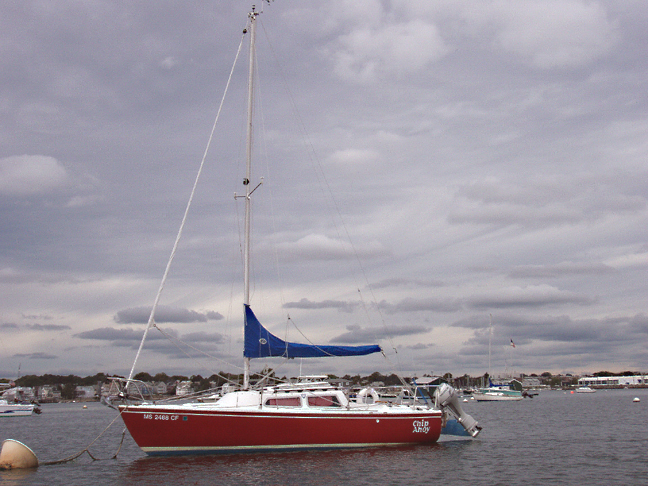 One of the problems I've had with my anchor/roller setup is when I get to my mooring. 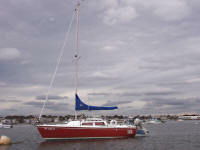 After bending two quick-release pins, I realized that in a breeze when Chip Ahoy swings on its mooring the tip of the anchor catches the taut mooring pennant as it crosses, putting considerable pressure on the anchor. Thus, eventually the pin would bend. 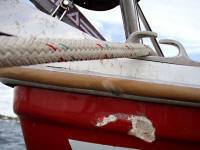 My solution is to remove the pin then lift and tie the anchor higher with the line to the bow pulpit. 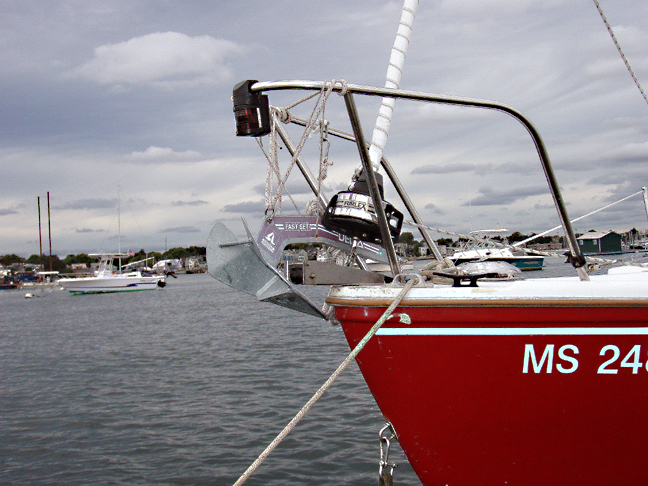 When I leave my mooring, I lower the anchor to the roller and reinsert the pin. This method, though a bit of a nuisance, has worked well . . . until now. 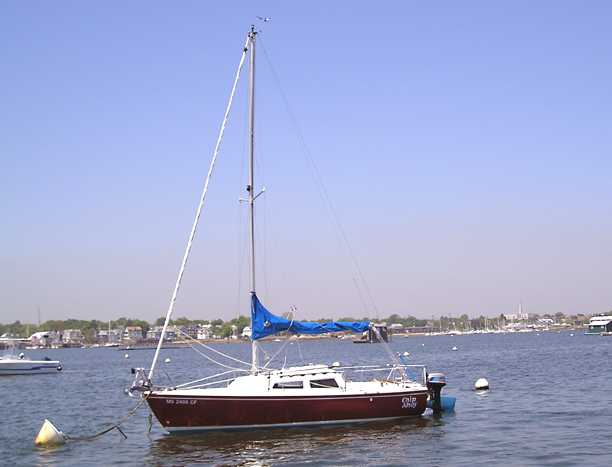 In Ernesto's wind (taut pennant) and waves (energetic, constant rolling and swinging), the line from anchor to pulpit had loosened -- or to be more accurate, my knots loosened -- and the anchor gradually lowered and caught the pennant. 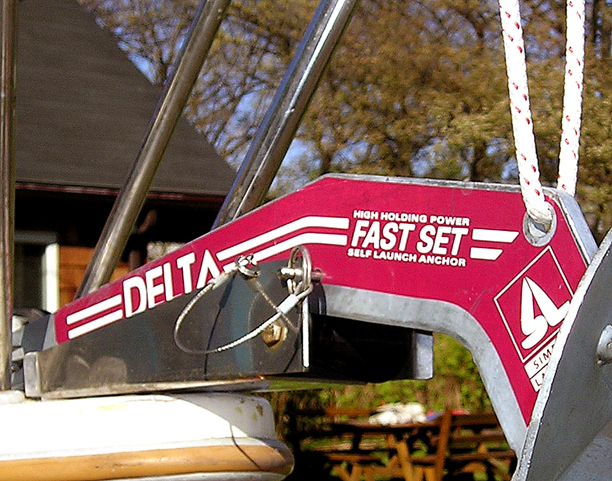 The pressure was so strong against the hull that the starboard fluke on the Delta anchor actually bent a bit. The tip of the anchor chewed into the hull and caused this gouge. Actually, I'm surprised the damage wasn't more extensive. For now I've tied the anchor back up, even higher, and used two separate lines. 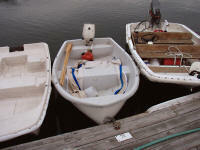 Under its cover, Chip Mate the dinghy fared somewhat better at the dinghy dock; at least not filling up with rainwater. 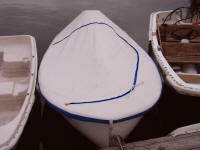 It is the worse for damage nonetheless, at the crowded dock. The outboard boat to its port has done some damage to its registration numbers, and the dinghy to its starboard is riding up over Chip Mate's covered gunwale, wearing on the new cover. 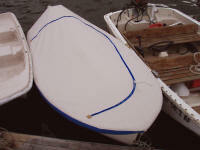 Chip Mate the dinghy is taking a beating at the dinghy dock; with it's cover at least it's not filling up with rainwater. But at the crowded dock, the outboard boat to its port has done some damage to its registration numbers, and the dinghy to its starboard is riding up over Chip Mate's covered gunwale, wearing on the new cover. 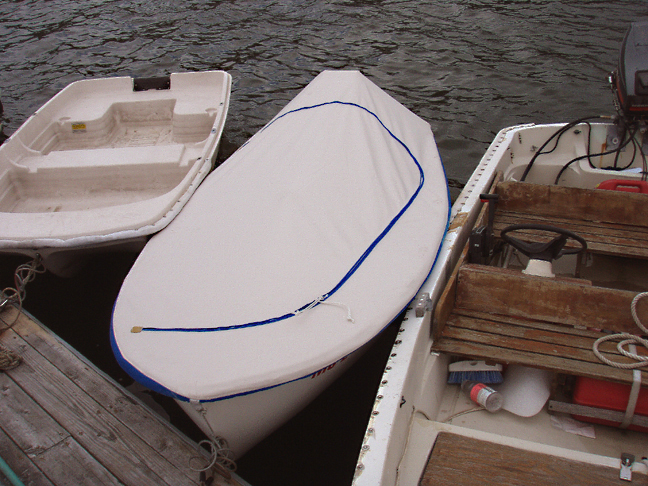 The outboard dinghy on its porst side has a good rubber rubrail all around its gunwale -- except where it's been torn off, missing -- and that, of course, is precisely where it's rubbing against Chip Mate. Now I know why I had to replace those damaged numbers last year. I'll be replacing them again next season too. 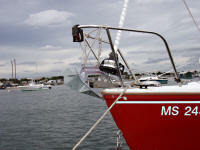 It's definitely time to rig up some permanent fenders on Chip Mate -- past time. Storms sure do expose any weaknesses! 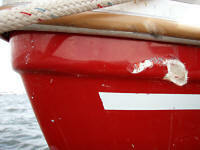 Approaching Chip Ahoy by dinghy, I decided to take a closer look at the damage to the bow from beneath . . . 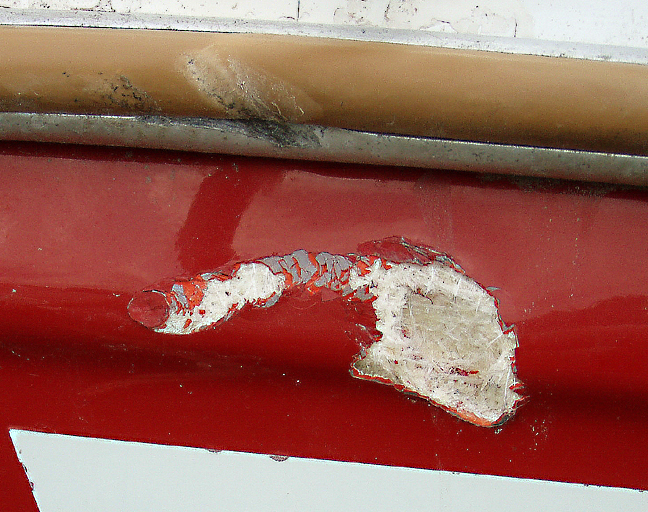 The damage as seen from the dinghy. 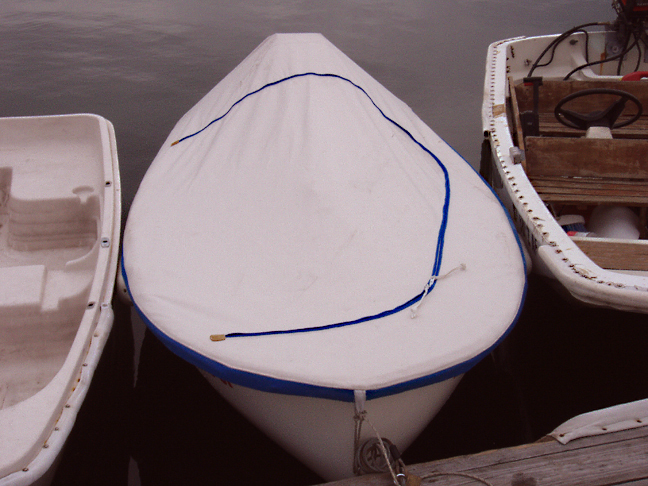 It's never-ending ... and Sailing Season '06 is nearing its end!